The Global Volcanism Program has no activity reports for Savai'i. The Global Volcanism Program has no Weekly Reports available for Savai'i. The Global Volcanism Program has no Bulletin Reports available for Savai'i. Savai'i, the largest and highest of the Samoan islands, consists of a massive basaltic shield volcano constructed along a WNW-ESE-trending rift zone that splits into two rifts on the east side of the 75-km-long, oval-shaped island. Pliocene and Pleistocene shield formation was followed by stream and marine erosion, partial submergence, and growth of coral reefs. Late-stage Pleistocene and Holocene eruptions produced voluminous lava flows that partially buried fringing reefs. 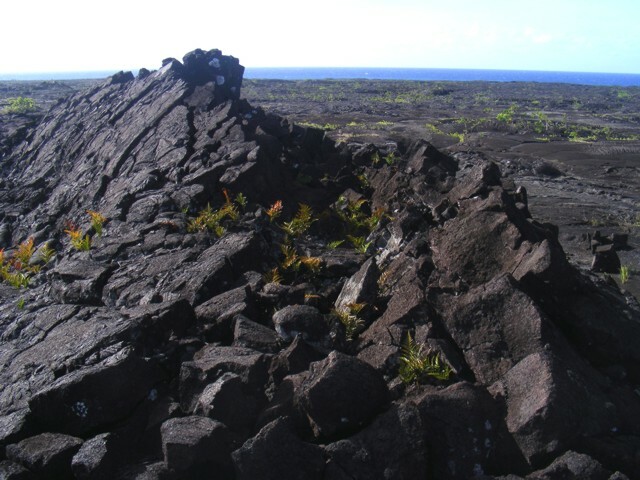 Numerous cinder cones and lava cones dot the broad crest of Savai'i, which has a low-angle, dome-like profile and reaches an elevation of 1858 m. Additional cones occur on the north-central flank, and a large number are found in the south-central part of the island. Three eruptions, including two in the 20th century, occurred in historical time, and produced voluminous lava flows that reached the northern coast along broad fronts up to about 15 km wide, destroying several villages and overtopping fringing reefs. Jensen H I, 1906. The geology of Samoa, and the eruptions in Savaii. Proc Linnean Soc New South Wales, 31: 641-672. Kear D, Wood B L, 1959. The geology and hydrology of western Samoa. New Zeal Geol Surv Bull, 63: 1-92. Nemeth K, Cronin S J, 2009. Volcanic structures and oral traditions of volcanism of Western Samoa (SW Pacific) and their implications for hazard education. J. Volcanol. Geotherm. Res., 186: 223-237. Nemeth K, Cronin S J, Lolo F, Leavasa M, Solomona D S, Nelson F, 2007. Volcanic evolution, oral traditions of volcanism of Western Samoa (SW Pacific) and their volcanic hazard implications. Geol Soc New Zeal, New Zeal Geophys Soc Joint Annual Conf, Prog Abs, p 113. Stearns H T, 1944. Geology of the Samoan Islands. Geol Soc Amer Bull, 55: 1279-1332. 1350 ± 50 years Unknown Confirmed Radiocarbon (corrected) Tafua Savai'i? There is no Deformation History data available for Savai'i. There is no Emissions History data available for Savai'i. Savai'i, the largest and highest of the Samoan islands, fills this NASA Landsat image (with north to the top). The 75-km-long island consists of a massive basaltic shield volcano constructed along a WNW-ESE-trending rift zone that splits into two rifts on the east side of the island. 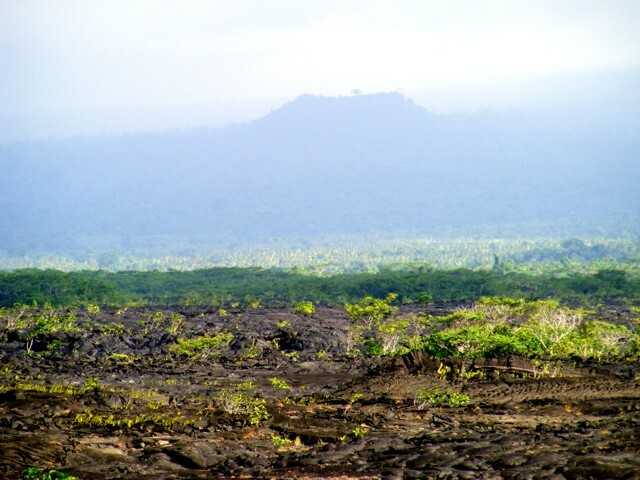 The broad crest of Savai'i is dotted with numerous cinder cones and lava cones, some of which were the source of historical eruptions that produced lava flows that reached the sea. 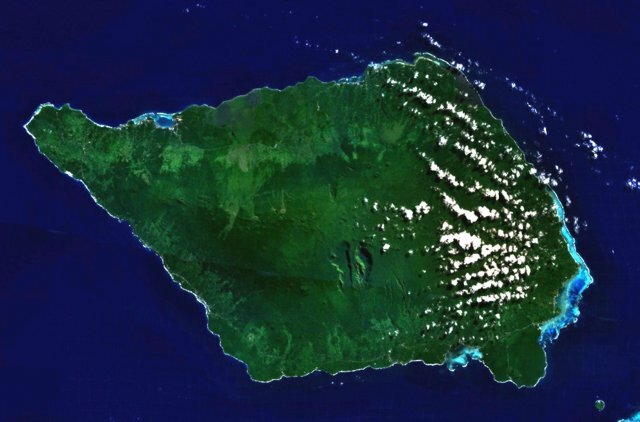 The oval-shaped, 75-km-long island of Savai'i, the largest and highest of the Samoan islands, consists of a massive basaltic low-angle shield volcano. Numerous cinder cones and lava cones dot the broad crest of Savai'i, which has a low-angle, dome-like profile and reaches an elevation of 1858 m. The fresh lava flows in the foreground were erupted during the most recent eruption of the volcano in 1905. Photo by Karoly Nemeth (Massey University). A major eruption of Savai'i took place from August 4 to November, 1905. Voluminous lava flows from the Matavanu vent on the north flank flowed 12 km to sea, destroying several villages and many fields. This image shows a pressure ridge on the lava flow, with the north coast in the background. There are no samples for Savai'i in the Smithsonian's NMNH Department of Mineral Sciences Rock and Ore collection. Large Eruptions of Savai'i Information about large Quaternary eruptions (VEI >= 4) is cataloged in the Large Magnitude Explosive Volcanic Eruptions (LaMEVE) database of the Volcano Global Risk Identification and Analysis Project (VOGRIPA).